The publication of the Saville Report, the inquiry into the British army massacre of 14 civil rights protestors in Derry in 1972, confirmed what the victims’ families had always known — that those shot had been unarmed and posed no threat to the British Parachute Regiment. 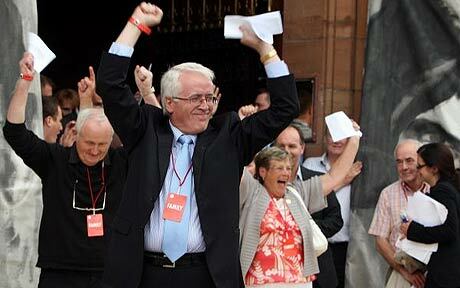 The victims’ families welcomed the report of the Bloody Sunday Inquiry, handed down on June 15. The inquiry was chaired by British law lord Mark Saville and launched in 1998. They were joined by thousands of supporters in a march to Derry’s Guildhall — symbolically completing the march route begun by thousands of civil rights activists on January 30, 1972. The official British line for the past 38 years, repeated by the media and “confirmed” by the inquiry chaired by John Widgery in 1972, was that those shot down — half of them teenagers — had been armed with guns and nail-bombs, and had opened fire on the paratroopers. The Widgery cover-up said that the paratroopers’ behaviour had “bordered on the reckless”. In contrast, Saville said there was no justification for opening fire and that all the soldiers who testified, bar one, had lied to the inquiry. Saville referred to one person who was shot while “crawling away from the soldiers”; another shot “when he was lying mortally wounded on the ground”. Bloody Sunday was a defining moment in the recent history of Ireland. The civil rights movement that had emerged in 1968 in the sectarian northern Irish statelet and demanded equal rights for the Irish nationalist and Catholic minority communities was literally shot off the streets. The British military had been deployed in 1969 to support the discredited Royal Ulster Constabulary (RUC) after the explosion of the civil rights movement and the sectarian pogroms against Catholics that followed. The British government claimed that its forces were being deployed to “keep the peace” between two warring communities — the mainly Catholic nationalists, supporters of Irish unity, and the mainly Protestant unionists, supporters of British colonial rule. But in reality, troops were sent in to prop up the crumbling statelet and maintain its union with Britain, something that quickly became clear to the nationalist community. Civil rights activists in Derry on January 30, 1972 were protesting against the army’s introduction of internment without trial in August 1971. By the time of the Bloody Sunday march, more than 2000 people, almost all of them nationalists or republicans, were interned without trial in prison camps. Following the massacre, the British government introduced direct rule from London. Bloody Sunday is largely regarded as the decisive factor that convinced a generation of young people that the only means to resist the oppressive Unionist state was to fight an armed struggle against the British army and RUC. The tenacity and determination of the Bloody Sunday victims’ families was applauded as “inspirational” by speakers in Derry as the report, that was supposed to be published in 2006, was finally released. Thousands of supporters from across Ireland and around the world have joined the families each year to march in Derry on the anniversary of Bloody Sunday, demanding justice for those killed. Unionist politicians and British military spokespeople have reacted angrily to calls for the prosecution of the individual soldiers responsible for the Bloody Sunday killings. But prosecuting the soldiers would not deal with the fundamental issue — that the killings were part of official state policy. In response to fresh calls by British military officials for the prosecution of Irish Republican Army members and leaders for historic actions, Junior Minister in the Stormont Executive and former IRA prisoner Gerry Kelly pointed out that the British state has until now acted with total impunity. “The difference is that 15,000 IRA prisoners served more than 100,000 years in jail,” he said. Speaking from Westminster following the report’s publication, British Tory prime minister David Cameron said the shootings were “indefensible”. His apology on behalf of the British government was welcomed in Derry. One British soldier present on Bloody Sunday, identified as Soldier 027, who has been in a witness protection program for the past decade, testified to the Saville inquiry that his unit was encouraged to “get some kills”. The significance of the Saville Report is that it challenges the official view of the role of the British military in Ireland and elsewhere. It exposes its real role as a colonial force willing to use brutal force to enforce its will. It adds weight to the campaigns for justice by other victims of British state killings, and to calls for a withdrawal of British troops from Afghanistan and Iraq. In the 36 hours after the introduction of internment in August 1971, 11 people — 10 men, including a mother of eight children and a local priest — were shot dead in Ballymurphy, west Belfast, by the same British Parachute Regiment later to be unleashed in Derry. 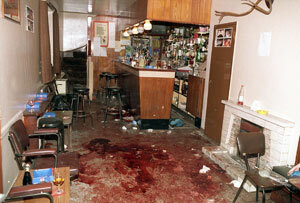 British military forces in Ireland and the RUC killed at least 363 people since 1969, most of them civilians. Loyalist death squads killed more than 1000 people — mostly Catholic civilians — often acting with the sanction or aid of British military intelligence and RUC’s Special Branch. From the open military repression and martial law tactics of the early 1970s to the running of loyalist murder gangs throughout the following decades, the British government’s actions had the same aim throughout the conflict: to terrorise and demoralise the nationalist population and crush their aspirations for democratic rights and a united, independent Ireland. A Police Ombudsman report is expected to confirm state collusion and cover-up in the Loughinisland massacre, in which six Catholic men were killed by a UVF death squad as they watched Ireland play Italy in the World Cup on 18 June, 1994, in the Heights bar in the small Co Down village. It is expected that in addition to confirming “major failings” by the police to properly investigate the Loughinisland attack, the report will reveal that four RUC Special Branch agents were aware that the UVF was planning the massacre. Eamon Byrne (39), Barney Green (87), Malcolm Jenkinson (53), Daniel McCreanor (59), Patrick O Hare (35) and Adrian Rogan (34) suffered multiple gunshot wounds in the back as they sat watching the game after two masked men stormed into the pub and fired up to 30 bullets from an AK-47 and a Czech-made rifle into the patrons. No-one has ever been convicted of the brutal sectarian rampage, which devastated the quiet village of Loughinisland and left nine children without a father. The report is the outcome of an Ombudsman review into failings by the RUC/PSNI to properly investigate the massacre, launched after the victims’ families filed a complaint in 2006 following revelations by investigative media reports that the getaway car was supplied by an RUC agent. Originally scheduled to be published last summer, the report was delayed and was due to be released on Tuesday 15 September – but the Ombudsman has now delayed its release for a second time, “for several weeks”, claiming new information must be assessed. The delay has caused more frustration for the families in that “new evidence” coming to light only days before the scheduled release of the report indicates either a failure of the Ombudsman’s investigation or else simple stalling on the release of what will inevitably be damaging information. •There persists a suspicion of state collusion in the murders. Specifically the families demanded to know if any of the suspects were working for Special Branch and why the car used by the killers to get away was subsequently destroyed by police. Other concerns were the fact that a viable hair follicle was recovered but nobody has been charged, and the fact that investigators reported at least one of the weapons used was imported from South Africa by British intelligence’s Force Research Unit agent Brian Nelson. A draft public statement on the investigation by the Police Ombudsman from 21 July, supplied to An Phoblacht, states the complaint that the investigation by the RUC/PSNI has not been properly carried out will be upheld. “Major failings have been identified. There was a failure to speak to persons of interest. There was a loss of policy logs,” the draft statement says. It says the allegation that no earnest attempt was made to apprehend those responsible will be partly upheld due to the “unavailability” of police logs and interview notes. Some suspects were swabbed for DNA samples while others were not. The draft statement also confirmed that there was no contact recorded between the RUC/PSNI and the victims’ families between 1994 and 2005 and that there was a consistent failure to update the families on developments. Police sources revealed to the media last weekend that the investigation’s report will reveal the role of four Special Branch agents within the UVF in ordering or organising the attack. The report will mention but not name the agents; however, it has already been established that Mark Haddock and Terry Fairfield were two of the agents involved. The RUC knew that Fairfield, an agent handled by Detectives Johnston Brown and Trevor McIllrath, provided the getaway car, a red Triumph Acclaim, used in the attack but he was not arrested and continued to work for Special Branch following the massacre. The Ombudsman’s draft public statement acknowledged the destruction of the car “was a breach of police procedure at that time” and “it should not have been destroyed”. Kevin Winters Solicitors, representing the families, wrote to the Ombudsman in October 2007 that the families had been advised by Detective Williamson on 11 October 2005 that “all aspects of the trail” relating to the car had been followed up in 1994 and he was “satisfied” with it. At a meeting between families and the PSNI on 11 October 2005, DI Wilson said that the rifle used in the attack “was a Czech-made weapon that was one of the weapons that came to [the North] from South Africa in the late 1980s” – in the weapons consignment effected by FRU agent Nelson. DSI Williamson said at the same meeting that three murders and two attempted murders, all attributed to the UVF, had been carried out using the same weapon. The families want to know which specific murders these weapons can be traced to; whether or not there was evidence of state collusion in these murders (including any evidence they came from the Nelson consignment); and whether or not there has been any prosecutions for the other attacks. While the Ombudsman’s report has yet to be released and the Loughinisland families reserve their assessment of its findings until it has been published, the draft statement shows several failings in the approach of the Ombudsman’s investigation and contradictions between its findings and its conclusions. It claims in the provisional statement that the allegation of state collusion has not been substantiated; that there was “no preventability” – but clearly if at least four Special Branch agents knew of the massacre plans, and were directly involved, the RUC would have had prior warning the attack was going to happen if not a direct hand in it. The fact that the report confirms a cover-up to protect agents, including the deliberate destruction of evidence, itself confirms collusion in the massacre. The draft statement says there is no evidence linking Nelson or the South African consignment to the weapons used in Loughinisland, contradicting the previous statements made by investigating officers – and then goes on to say that the failure to establish the ballistic history is a “substantial failing” by the police. The Ombudsman’s office failed to arrest and question the handlers of the agents involved, or the officers responsible for the destruction of evidence and says there is “no evidence of crimiality” on the part of police. However, whether there is the basis to prosecute those responsible for the collusion and cover-up will be one of the issues that can be judged by the victims’ families on the publication of the Ombudsman’s final report. THE British Government has signalled it may avoid holding even a controlled inquiry into the murder of Pat Finucane, an international conference in honour of the Belfast solicitor at Dublin’s Trinity College was told on Saturday. The conference paid tribute to the life, work and legacy of Pat Finucane on the 20th anniversary of his murder. Delegates heard from an impressive international panel of leading human rights activists and legal figures including Pat’s wife, Geraldine Finucane; Canadian former Supreme Court judge Peter Cory; leading British human rights laywer Michael Mansfield QC; and the former UN Special Rapporteur on the Independence of Judges and Lawyers, Param Cumaraswamy. Addressing the conference, Belfast solicitor Peter Madden, who shared a legal practice with Pat, read from a letter the Finucane family had received from the British Government on the anniversary of Pat’s death. British Secretary of State to the North Shaun Woodward’s Principal Under-Secretary, Simon Marsh, wrote that the Government was considering the report of the Eames/Bradley Consultative Group on the Past and that “no decision has yet been taken by Government in relation to any of the group’s recommendations, including their recommendations in relation to any Finucane inquiry”. Geraldine Finucane said the family firmly rejects the idea that the past could be swept under the carpet. Jane Winter from British Irish Rights Watch also voiced her concerns. Madden said that while there while the aspirations towards reconciliation in the Eames/Bradley report are positive, “the way to achieve reconciliation is not through burying the truth”. Michael Mansfield said he is appalled at the suggestion that holding an open inquiry into Pat’s death would not be in the public interest. “The only ones who should decide what’s in the public interest are the public,” he said. “The British Government sending this letter on Pat’s anniversary is no coincidence. Well, we will send the British Government a clear message back from this conference: we will not settle for anything less than the full truth because Pat was just the tip of an iceberg of a British policy of systemic collusion – and some of the operative that would be revealed are still operative. Mansfield outlined the drive by the British Government to keep inquests out of the public eye. The Inquiries Act 2005, which allows the home secretary to issue ‘restriction orders’ on an inquest enabling the withholding of evidence from the coroner, is the “only possible” means for investigating the Finucane case, the British Government insists. It is a transparent attempt to conceal the role of Government security agencies and the political establishment’s role in “controversial” killings. “Now the new Coroners’ Bill, going before the parliament this year would, if passed, allow for the Secretary of State to decide that inquests should be held in secret if it is in ‘the national interest’,” the QC explained. Belfast High Court judge Séamus Treacy spoke about the advances in human rights law that Pat’s work, together with Peter Madden, achieved in 10 years of practice. Former UN Special Rapporteur on the Independence of Judges and Lawyers Param Cumaraswamy said: “Along with everyone else in this room, I deeply admire the courage and determination of the Finucane family. “I was given an assurance by Tony Blair in April 2001 that there would be an independent inquiry into Pat’s murder – which, eight years on, has not eventuated,” he said. Param Cumaraswamy also discussed the failure of the British Government, RUC and Law Society in the North to provide protection for Rosemary Nelson, who was murdered in a loyalist car-bomb in March 1999.